A lot of people looking to heal their acne naturally use omega-3 supplements, like fish oil, cod liver oil, or even krill oil. What you’d probably be surprised to hear is that low-quality, rancid omega-3 supplements can actually cause acne if you’re not careful. 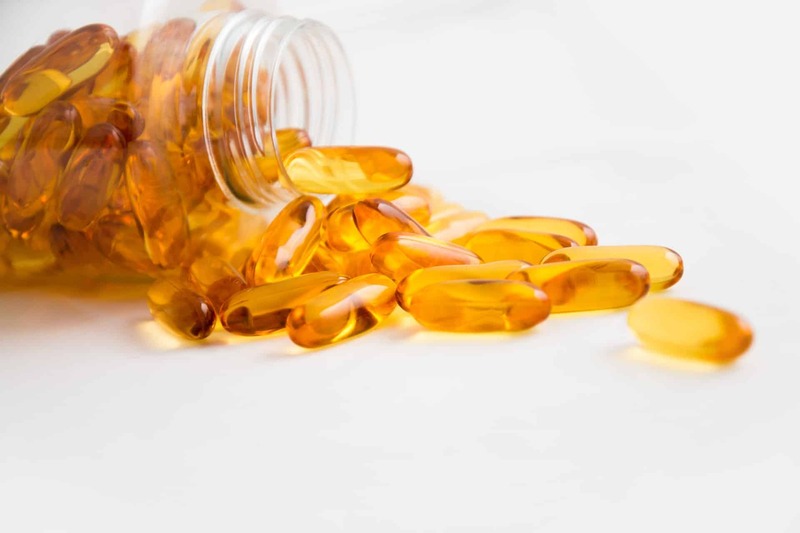 In this article, we’ll take a quick look at why omega-3 supplements look great on paper for treating acne, but might actually do more harm than good. Finally, we’ll look at the best brands and types of omega-3 supplements for acne. Inflammation is a key factor in acne. Inflammation occurs when the immune system responds to threats. One of the threats it responds to is acne infections. When a pore becomes clogged or blocked due to hormones triggered from eating carbs, sugar or dairy, the body will typically fire off an inflammatory response. In most individuals, this isn’t a problem – but for people with chronic inflammation, a condition where the immune system is extremely overactive, these relatively harmless acne infections trigger a huge inflammatory response. What happens when inflammation is constantly triggered for acne infections? Redness and swelling on the skin – in other words, pimples. If you can manage to reduce inflammation, you can easily reduce the appearance of your acne and the likelihood that whiteheads and pimples appear. That’s why some omega-3 supplements are so effective at treating acne. Omega-3 fatty acids are anti-inflammatory – they tend to lower markers of inflammation in the body and improve acne. Omega-6 fatty acids are inflammatory – they tend to increase markers of inflammation in the body and worsen acne. Unfortunately, many studies and countless forum posts also show that some people’s acne actually gets worse taking omega-3 supplements. Essentially, fish oil supplements are extremely likely to cause inflammatory acne if the supplements are rancid or oxidized. You might be surprised to hear that an extremely high percentage of omega-3 supplements, including fish oil and cod liver oil, are actually rancid. When omega-3 fatty acids become oxidized or rancid, they actually show the opposite effect when it comes to inflammation – they trigger inflammation and worsen symptoms of inflammatory acne. Basically, if you’re buying low-quality fish oil or storing them improperly, then your fish oil very well may be oxidized and you may be causing acne. Luckily, it’s fairly easy to tell if fish oil is rancid, and buying high-quality omega-3 supplements can easily sidestep this issue. Essentially, you should be able to tell fairly easily if fish oil is rancid or oxidized. There are a few simple ways to prevent your fish oil from going bad. The absolute best way to get DHA & EPA omega-3 fatty acids is through eating wild-caught, fatty fish, like salmon, sardines, mackerel, and anchovies. They offer naturally-occurring antioxidants, skin-clearing nutrients, and more bioavailable, stable omega-3s per serving. Still, not all of us can afford or have access to wild-caught seafood. For the rest of us, a high-quality DHA & EPA omega-3 supplement can be a huge asset in preventing and treating inflammatory acne. DHA & EPA are the two types of omega-3s that are most easily absorbed by the body and show the largest anti-inflammatory effects. Vegan, ALA omega-3-based supplements, usually sourced from nut oils or various plants, are generally less effective than marine-based omega-3 supplements. Overall, there isn’t a single best form of omega-3 for acne, it depends all on your needs. If you can afford it, Sport’s Research Krill Oil is probably your best bet when it comes to omega-3 supplements. It has been shown to be more easily absorbed by the body and contains the potent antioxidant, astaxanthin, that helps prevent it from becoming rancid and oxidated. Astaxanthin also can help protect the skin and prevent UV and environmental damage, and may actually prevent acne. Despite being lower in DHA & EPA, the omega-3s in krill oil are more bioavailable, which means you might actually absorb more omega-3s than if you were to take fish oil. Still, krill oil can be a little expensive. Regular fish oil will do just fine if it’s from a quality source. Non-oxidized and rancid fish oil is a great way to decrease inflammation on a budget. I prefer Sport’s Research fish oil – it’s always fresh, sourced from wild-caught fish, and comes in a dark, pre-sealed package. If you’re Vegan, then there’s no problem going with a high-quality Vegan algae supplement – studies show that the body absorbs omega-3s from algae just as well as omega-3 from fish. You should avoid an ALA omega-3 supplement. ALA omega-3 is not absorbed efficiently by the body and is a huge reason why people transitioning to a Vegan Diet get acne. When it comes to cod liver oil, that’s really another topic entirely – there are a lot of conflicting articles and research on whether or not cod liver oil is really safe for consumption. It can easily go rancid, and many of the most popular brands were found to be oxidized. Even several premium fermented cod liver oil brands have had quality control issues in the past. While it does have the added benefit of retinol vitamin A, you’re better off getting it through grass-fed beef liver and not risking the effects of rancid oil. Unlike the other 3 main forms of omega-3 supplements, due to quality control issues, I don’t feel comfortable recommending a specific brand of cod liver oil. Should you take fish oil for clear skin? Fish oil, krill oil, cod liver oil, and algae oil are all extremely rich sources of omega-3 fatty acids. Omega-3 fatty acids decrease inflammation and can help treat acne by decreasing the body’s inflammatory response to acne infections. Unfortunately, studies show that many omega-3 supplements contain rancid, oxidized fish oil. These rancid supplements are actually more likely to cause inflammatory acne than treat it. For that reason, it’s crucial to buy high-quality omega-3 supplements and store them in a cool, dark place. Still, omega-3 supplements don’t make up for a diet high in inflammatory oils and carbohydrates. 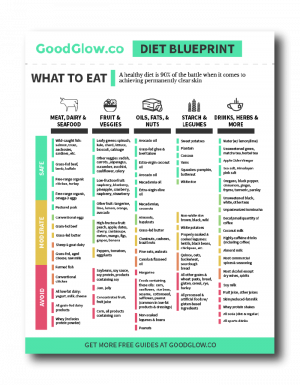 If you’re looking for a guide to eating for clear skin, check out our GoodGlow Diet Blueprint. It has everything you need to get started, including inflammatory foods to avoid and inflammation-fighting foods to eat, all on one page. What has your experience been with omega-3 supplements and acne? Have fish oil supplements helped or hurt your skin? Let me know in the comments below.